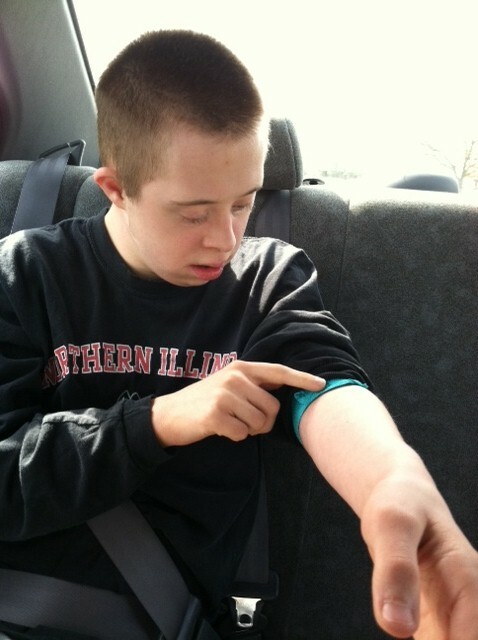 Over the weekend, we took Nick over to the clinic to get his blood drawn. I say we, because it is no longer something I can do alone. Nick is strong and getting his blood drawn requires some muscle power. At least 3 people to hold him down and one nurse to do the procedure. Just when you think you have him locked down another appendage will wiggle out and break free. I am not sure which is worse this or trying to bathe a cat. I can’t say I blame him. I am not a big fan of blood draws either. I turn my head the other way so I don’t get light headed and pass out. Nick did a decent job and recovered quicker this time. Of course his arm then becomes incapacitated the rest of the day. Last year it was much worse, they had to draw three viles of blood instead of one. 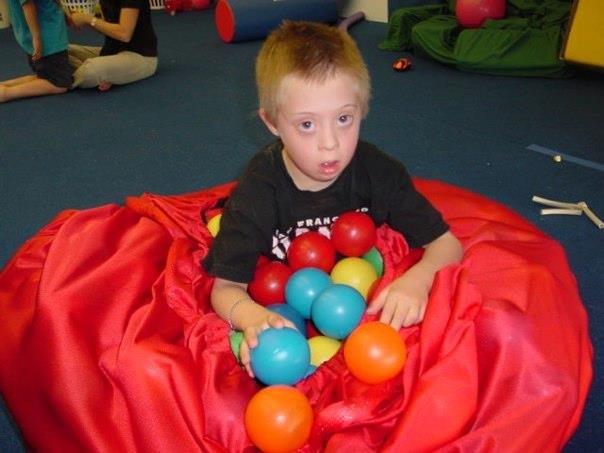 There are health issues that can occur with having a child with Down syndrome. 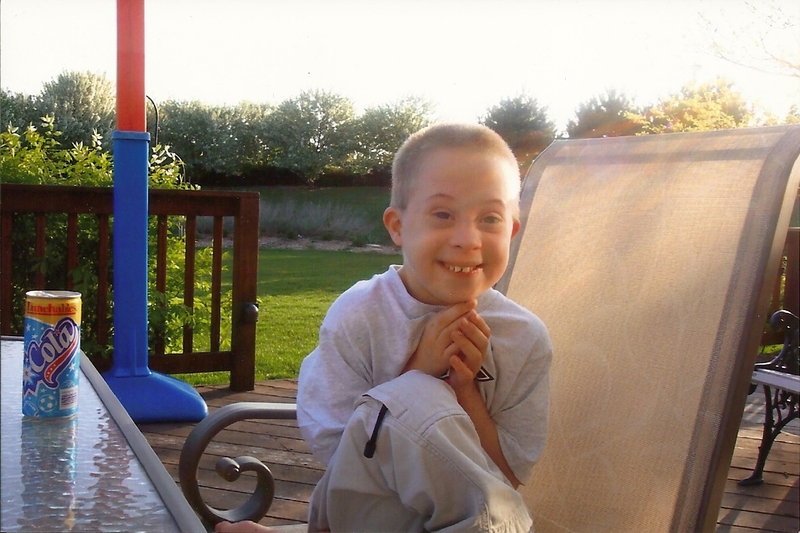 People with Down syndrome have an increased risk for certain medical conditions such as congenital heart defects, respiratory and hearing problems, Alzheimer’s disease, childhood leukemia, and thyroid conditions. In addition, all children with DS should be screened for Atlantoaxil subluxation or dislocation. This is done with a cervical spine X-ray. If the distance between the axis of the first vertebra and the second vertebra is more than 4.5 mm restriction from sports is advised. 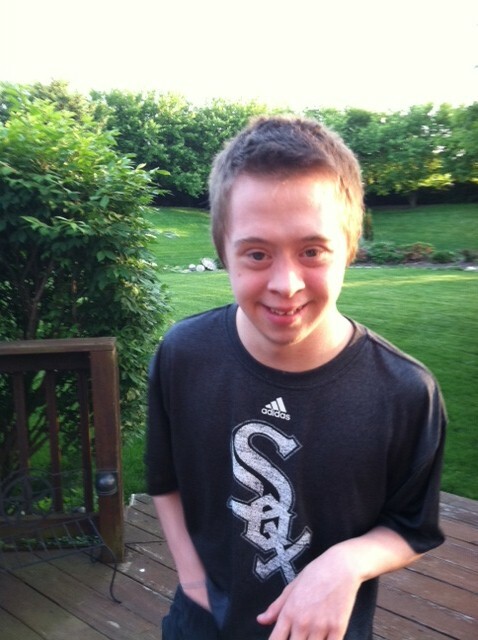 Nick’s registered at 3mm so it was under the limit and thus no restrictions in physical activities. 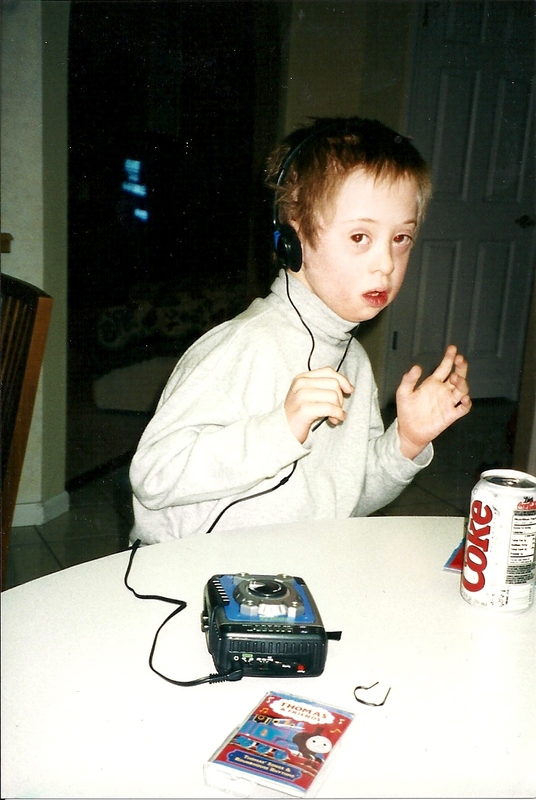 Many of these conditions listed above are now treatable, so most people with Down syndrome lead healthy lives. 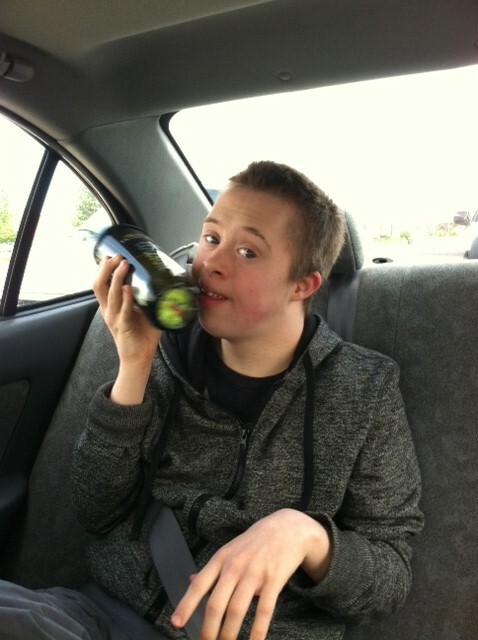 For more information about Down syndrome read Blog # 7 Mama Mia. I am very grateful that Nick has been healthy and he has only had a few minor problems over the years. Well with the exception of when he was born. 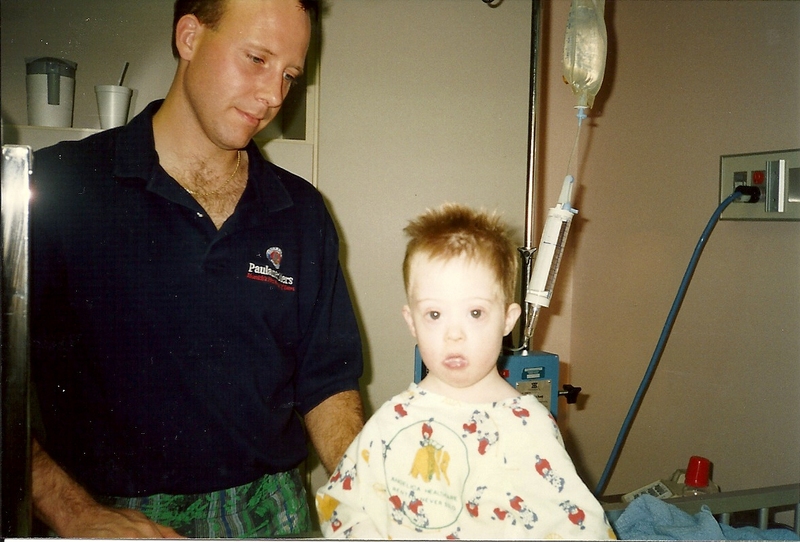 Nick was in ICU for a week and kept on oxygen and had tubes strapped all over him to monitor his vital signs. The neo natal specialist noted that he was having trouble breathing. A few days later an ultrasound was done that showed no signs of having any heart defects but rather a valve in the lung that was not closing properly. Fortunately, this was something that closed on its own. He was discharged after a week and sent home with a monitor that was used at night as a precaution. Besides this initial scare, his health issues have been minor. He had his share of ear infections growing up. 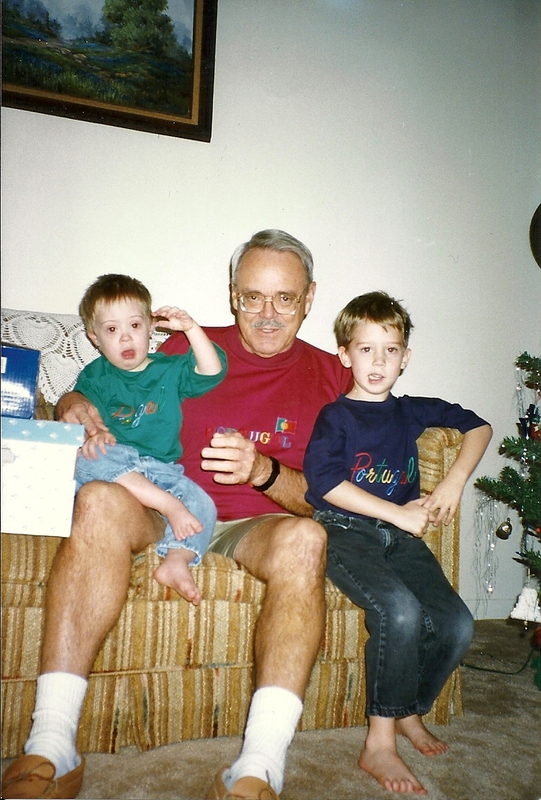 Here he is with his brother Hank and Grandpa Tommy back when we lived in Texas. Nick has had a few sets of ear tubes put in over the years. This is an outpatient procedure and seemed to help eliminate the ear infections. At age three, he had his tonsils and adenoids removed. It is so hard to see your child in pain isn’t it? 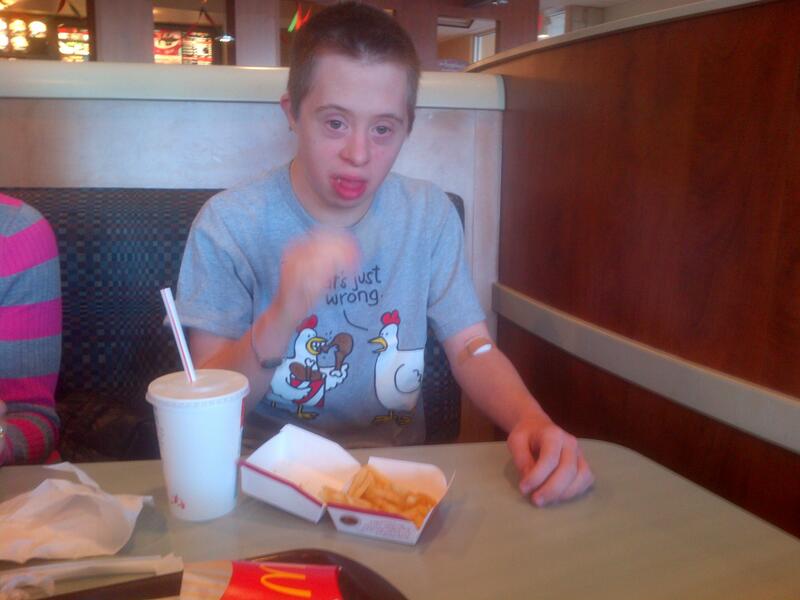 From a health standpoint, we have had it easy compared to a lot of kids with and without special needs. My first prayers in the morning are always for good health for my family and friends. It is a gift that should never be taken for granted. “He who has health, has hope; and he who has hope, has everything.” Arabian Proverb That’s what is in my noggin this week. Until next Monday, cheers to good health! I am not sure how this blog is going to come off this week. I am surrounded by loud banging while the workers are replacing the siding on our house. Unlike Saturday when it felt like they were going to come straight through the roof this is more like a piercing in the walls coming at me from all three sides. Add the sound of scraping metal like finger nails on a chalkboard….You get the picture now, right? It’s like Nick stimming and banging times a trillion. I should take an Advil now before the pounding goes to my head. So here we go…….. It was during Thanksgiving week in 2001 when we made our way across the country on our move from the San Francisco Bay area to Chicago. I am a native Texas gal. Right from the *get-go I noticed a few different things and that there would be a learning curve to living in the Midwest. Before I roll up my sleeves on this piece I think I will retreat to the basement, which bring me to my first observation. There are no basements where I grew up in Texas. It’s nice to have the extra space for the kids to stretch out and play when the weather gets too cold outside. Speaking of cold, the first day I went out to get groceries it must have been 45 or 50 degrees. In route to Meijer, I was shocked to see the mail carrier wearing shorts. Once I got to the store I bought a pair of gloves and put them on right away. A few weeks later, we were at the mall. I remember asking my Mother in law, Theresa why there were red stakes on top of the fire hydrants. She explained that is so the firefighters could locate the hydrants when the snow gets high. After I picked up my jaw off the floor I had to wrap myself around the fact that I was going to have to learn to drive in the snow. It was not going to be easy as I had a Ford Explorer with rear wheel drive (I bought the car in Texas, no front or four wheel drive required.) The trick is to pull out slowly and let the wheels grip otherwise the wheels just keep spinning around. 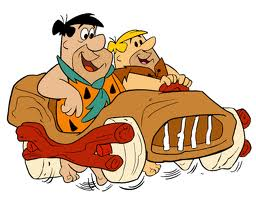 It was like driving Fred Flintstone style……. Here’s another tidbit, I learned…. If you squirt the windshield wipers under 20 degrees without the proper fluid with de-icer your windshield immediately becomes an ice rink and you will have to stick your head out the side window to see where you are going. In addition, you don’t want to leave liquids open in your car otherwise the insides of the windows will be covered with ice condensation. Out in the community I noticed little things like how all the restaurants have coat hooks by each booth. My favorite is when you leave the grocery store a strong blast of warm air shoots from the vents just before you are thrust out into the cold. Around the neighborhood some things I noted where that many of the houses aren’t fenced in and the backyards just blend from one to the other. 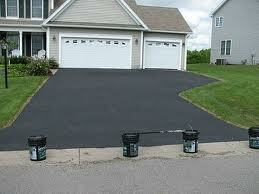 A large majority of the driveways are black asphalt rather than cement. 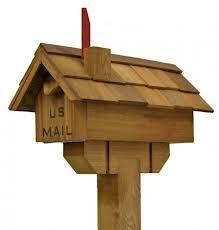 Nearly every mailbox has a wood house build around it like this….. Except ours 🙂 Do the mailboxes really need their own little house? Many things have changed during our time here. 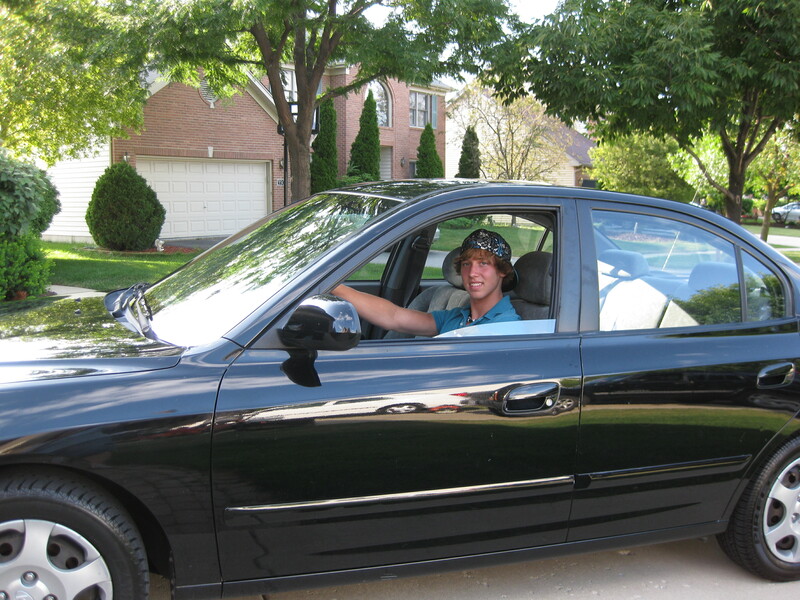 Now, I have a car with 4 wheel drive and heated seats….. toasty and a worthwhile investment! 🙂 The kitchen has undergone a remodel and the boys have gotten much bigger. 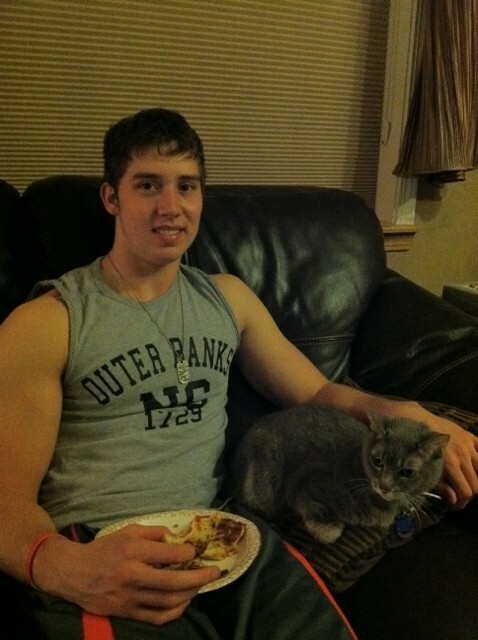 Hank now, age 20 and Mellie, age 17…..
And now….My how technology has changed over 10 years…. His taste in music and movies has evolved; well I guess you could say it has. At least it progressed out of Barney and Thomas the Tank Engine songs and movies to The Nutty Professor and Mrs. Doubtfire. 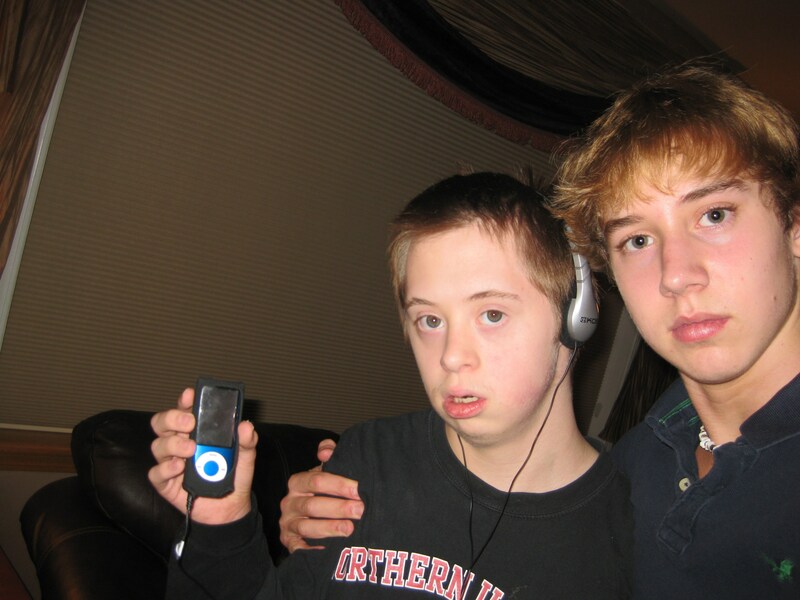 His ipod playlist is legit now thanks to his brother, Hank. That’s what is in my noggin this week. Until next Monday remember that time has a way of flying by. Be sure and enjoy the ride! This week I want to expand more beyond the one aspect of “stimming” which I wrote about last Monday. I want to dive in deeper into the sensory processing machine. Admittedly, this subject has always turned me on. Over the weekend Nick and I attended the NADS (National Association for Down Syndrome) Retreat that targets a special group that deals with more than just Down syndrome. The hot topic was Sensory Processing Disorder (SPD) was formally called Sensory Integration Disorder. Katie Frank, MHS ORT/L who works at UIC Family Clinic in Chicago was our presenter who outlined a summary for us. Thanks Katie for shedding more light to this topic. Here is my perspective about this subject. When a person has SPD, the flow is disjointed and the brain is unable to do the job of organizing sensory messages. Imagine a superhighway… You know that wide solid blue line on the map that flows effortlessly at 70mph+. That is how the messages should transmit from the brain to the body. But what if it looks like the tiny grey line on the crumbled map you are trying to unfold and read. That crooked road that breaks off and leads you into a desolate farm land area trundling at 15 mph…… THAT is SPD! A formal diagnosis cannot be given by an occupational therapist but they can do assessments and make recommendations to a doctor. The diagnosis is given when the problems impact the ability for a person to function in daily life. Under-responsive (formerly known as Hypo sensitive) is where a person may take longer to feel input, aka a sensory disregarder. They may be unaware of the feeling of messy face or hands and not recognize touch or the feel of an object being dropped. This person may be more socially withdrawn and may need coaxing to get engaged into the world. 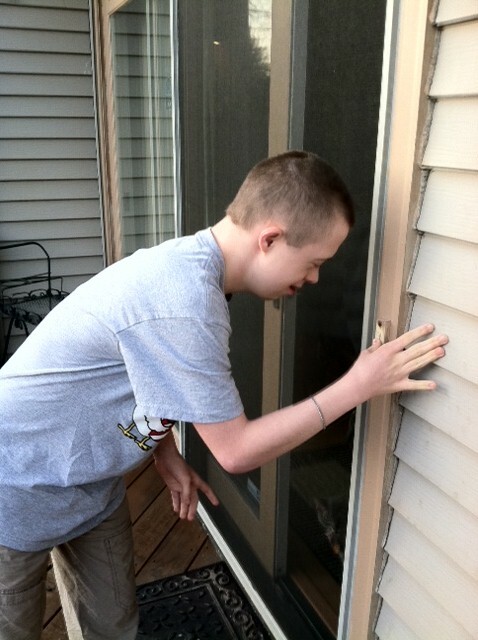 Sensory Seeking a person goes out of their way to find more input in their world. They crave stimulus. This for the most part IS Nick’s world. 🙂 Often when he walks his feet will hit the ground loudly. His “heavy walking” as we have termed it is seeking extra feedback. If there is a puddle he will step hard into it to get the splash to seek input. He chews on inedible objects in particular his sleeves.) 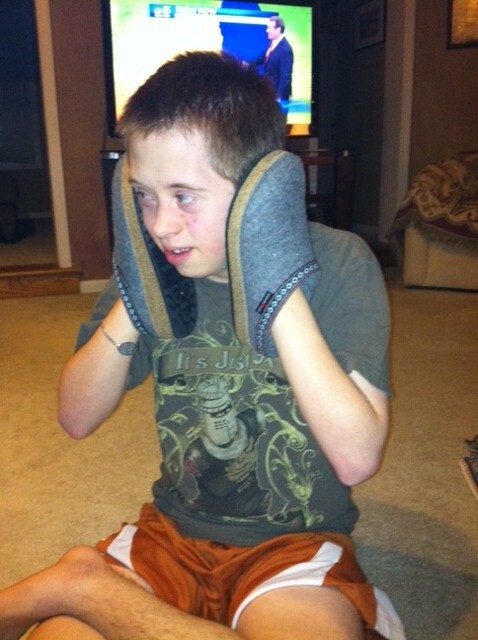 Nick also likes to push buttons on the phone intercom, microwave and often turns up the volume on the TV to 96! He delights in turning on the water faucets full blast. So you see he is looking for more input in various ways. Check out Blog # 3~ “Getting your Goat” to get a complete picture and list of things that he has gotten his hands on and dumped out. So knowing the types of Sensory Modulation is all fine and dandy. But what can be done to address these problems? That is where the Sensory Diet comes in. An occupational therapist can assist with putting supports in place to help with this. In a typical day we all strive to stay at a certain level of function where the keel sails evenly through the water. Not too hyped up or sluggishly dragging, right? If a person is under-responsive it is necessary to include “alerting activities” which will give them a boost. These might include bouncing, jumping, hanging from monkey bars. In Nick’s day he may need to take a motor break and go jump on the trampoline or get on a swing to rev him back up. Using a special nubby cushion can help keep a person alert while working at a desk. 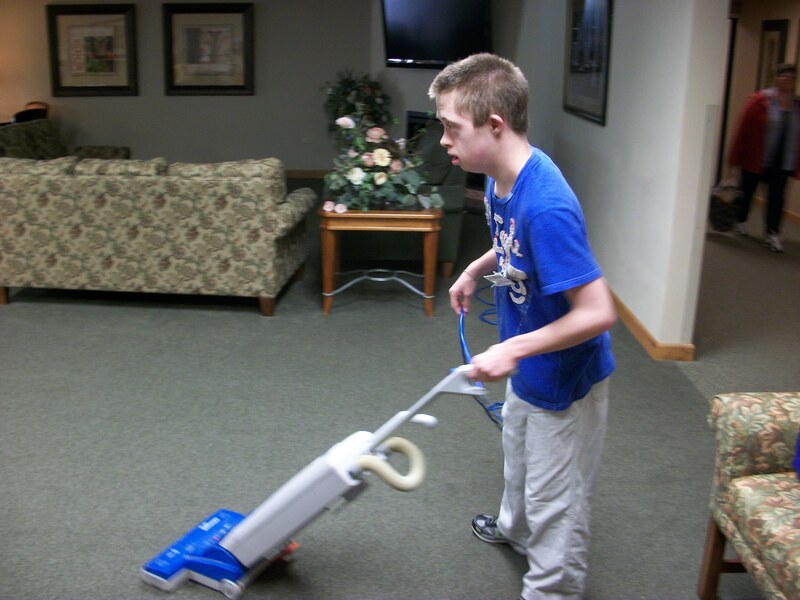 “Organizing activities” can also help a person who is having trouble attending to a task. For some people it may be deep pressure or heavy work that helps. Others may need something more oral motor related. “Calming activities” help decrease the sensory over-responsiveness and might include deep pressure, joint compressions, massage, gentle rocking, rhythmic movement, taking a bath, muted light, etc. Bottom line, it depends on the individual. Some senses may/or may not be more sensitive than others. The parent can do some detective work to see what is needed and how their child reacts then work with an occupational therapist who will tailor a sensory diet to fit their needs. Here is a list of heavy work activities/proprioceptive activities that may help regulate a child’s arousal level, concentration, ability to sit still and attend to a task or fall asleep. Carrying objects such as groceries, animal backpacks, a fanny pack, stacking or moving chairs/books, and a full watering can/hose, basically ANYTHING with weight to it. Wearing a weighted vest, weighted hat, or weighted shorts, wearing wrist or ankle weights, using a weighted pad on lap or across the shoulders. 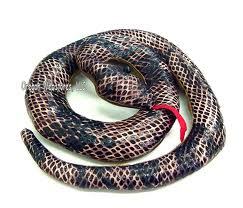 It could also be something like a long door draft or even a toy snake……. Toy/regular shopping cart, laundry basket, kid’s wagon, raise/lower flag at school, tug of war rope, toy/regular vacuum, wrestling, hippity hop ball. Make a child “sandwich” between floor pillows, cushions or bean bag chair, roll child up in mat or heavy blanket as a “hot dog” – bear hugs. 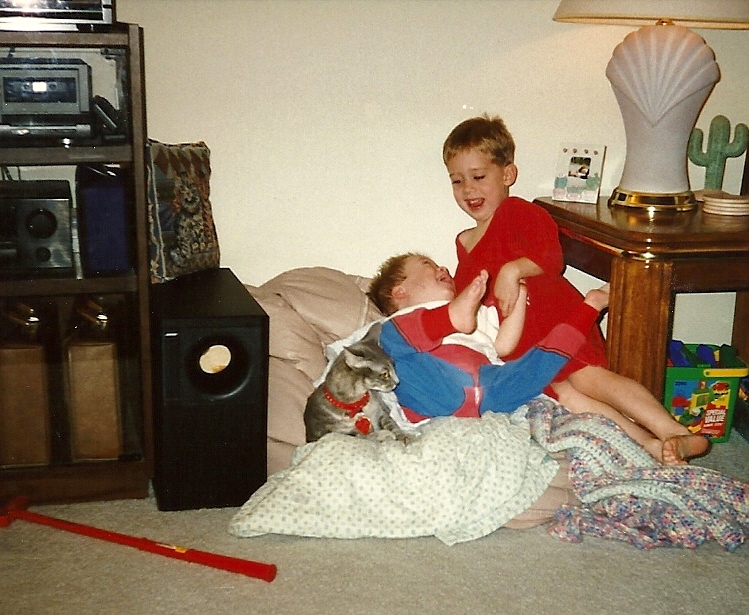 Siblings and pets make great deep pressure and wrestling pals…..
Resistive sucking using items such as through thin curly straws/krazy straws – sports bottle with long straw, lollipops, blowing bubbles, sour/citrus or salty flavors can alert the mouth. We all have aversions certain senses. It might be something tactile like tags on clothing that personally drives me nuts. 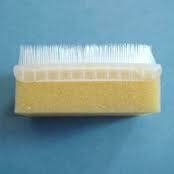 Tactile issues can be addressed with the Wilbarger Protocol technique (most known as the brushing program.) Many parents of children with autism have reported that their children have responded positively to the Wilbarger Protocol technique. 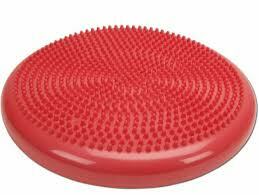 This is a brushing program that should be administered by an occupational therapist. Reports have shown a reduction in sensory defensiveness, as well as improved behavior and interaction. 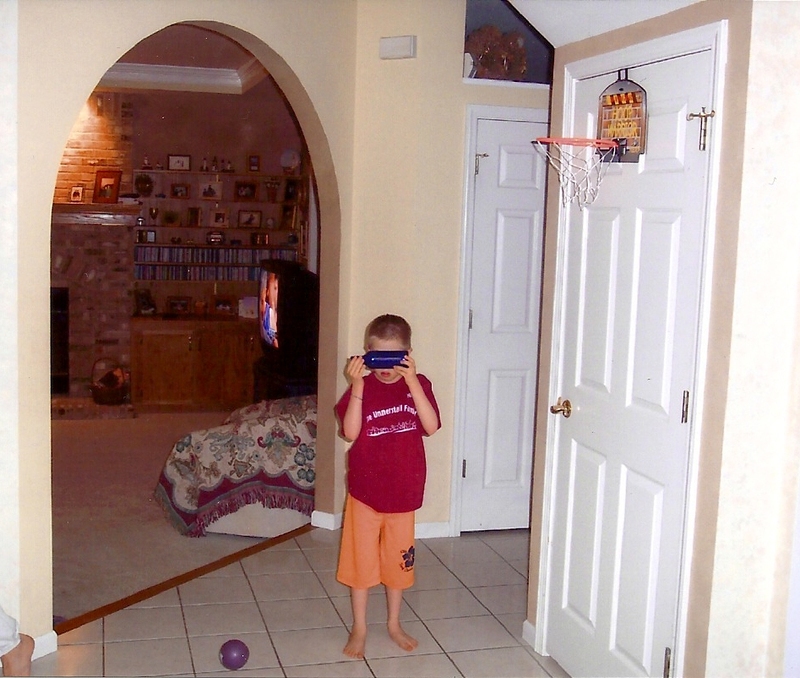 Many adults with autism have also reported reduction in sensory defensiveness, decreased anxiety, and increased comfort in the environment through the use of this technique. 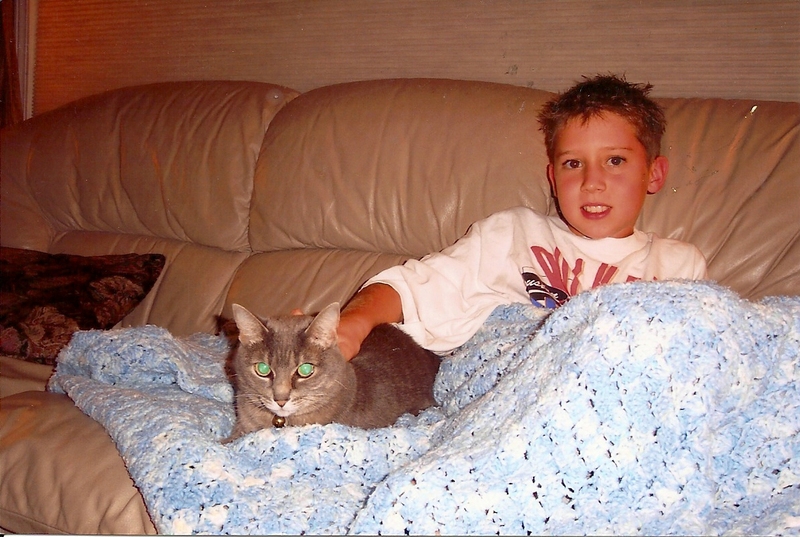 We did this program with Nick for many years when he was little…. Certain textures may be unpleasant or down right unbearable. Personally I can’t stand anything globby and lumpy like tapioca pudding, cottage cheese and flan….. blech! My sister in law, Ali cringes at anything in the green slimy family like olives, artichokes, avocados, anchovies or hearts of palm. So what is it that you can barely tolerate? Is it tactile, a certain smell or noises? Do you love loud music or does it overwhelm you? 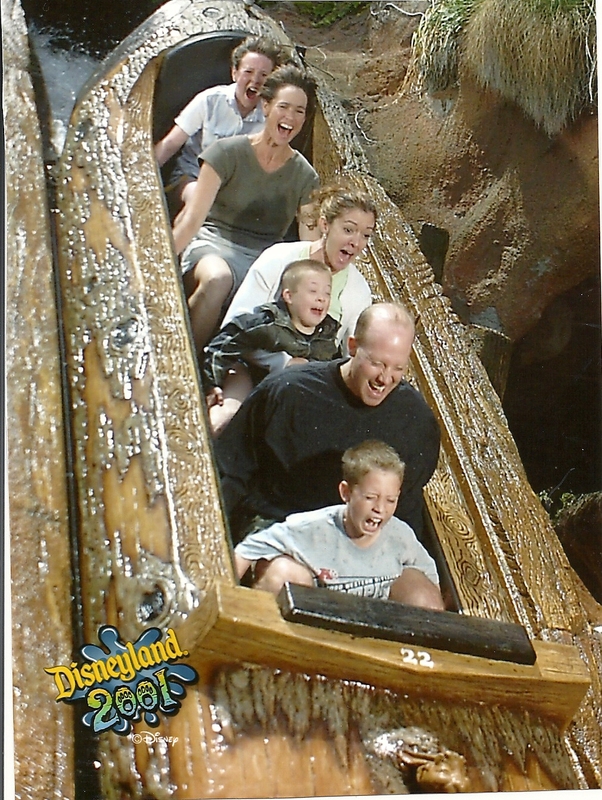 Do you sprint to the roller coaster rides or shy away from them? Is there a type of clothing that you are sensitive too? What calms you….. any certain genre of music, exercise, maybe the sound of a fountain? I would love to hear from you on this. I plan to write another story closer to the holidays when we are all bombarded by stimulus overload. I hope this week you gained some insight into how the senses are such a huge part of how we navigate the world. That’s what is in my noggin this week. Take a look around your world and let me know what you see that overwelms you or helps to keep you calm. You can e-mail them to me at: tjunnerstall@comcast.net. Cheers and see you next Monday! ****** News flash********** OOOOPS he did it again. #27 Fire alarm pull over the weekend in the hotel at the NADS Retreat. Stimming is awesome, admit it we all really enjoy it! Now that I have your attention I thought I would share a little bit about Nick’s world and what turns him on. What Is Stimming and Why Is It Common In Autistic People? Answer: The term “stimming” is short for self-stimulatory behavior, sometimes also called “stereotypic” behavior. In a person with autism, stimming usually refers to specific behaviors such as flapping, rocking, spinning, or repetition of words and phrases. Stimming is almost always a symptom of autism, but it’s important to note that stimming is also a part of most people’s behavior patterns. If you’ve ever tapped your pencil, bitten your nails, twirled your hair, or paced, you’ve engaged in stimming. The biggest differences between autistic and typical stimming are the choice of stim and the quantity of stim. While it’s at least moderately acceptable to bite one’s nails, for example, it’s considered unacceptable to wander around flapping one’s hands. There’s really no good reason why flapping should be less acceptable than nail biting (it’s certainly more hygienic!). But in our world, the hand flappers receive negative attention while the nail biters are tolerated. Like anyone else, people with autism stim to help them to manage anxiety, fear, anger, and other negative emotions. Like many people, people with autism may stim to help themselves handle overwhelming sensory input (too much noise, light, heat, etc.). Unlike most people, though, individuals with autism may also self-stimulate constantly, and stimming may stand between them and their ability to interact with others, take part in ordinary activities, or even be included in typical classrooms. A child who regularly needs to pace the floor or slap himself in the head is certain to be a distraction for typical students. It’s not completely clear why stimming almost always goes with autism, though it’s often called a tool for “self regulation.” As such, it may well be an outgrowth of the sensory processing dysfunction that often goes along with autism. At times, stimming can be a useful accommodation, making it possible for the autistic person to manage challenging situations. When it becomes a distraction or causes physical harm to self or others, though, it must be modified. Lessening or modifying stims can be tricky, but several approaches may be helpful. 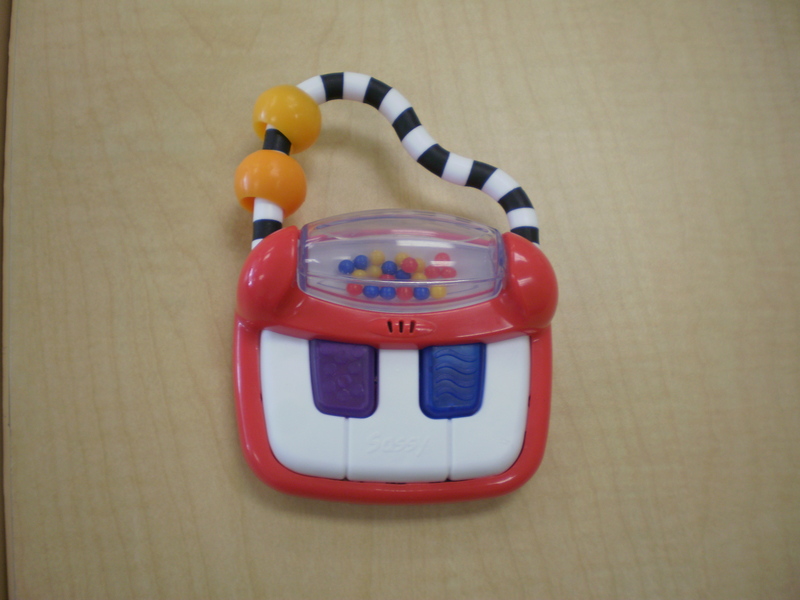 Applied Behavior Analysis (ABA) may help individuals to eliminate or modify some of their stimming. Occupational therapy is another useful tool. In some cases, stimming can be reduced with medications that address underlying issues of anxiety. Finally, some people with autism can learn through practice and coaching to either change their stims (squeeze a stress ball rather than flap, for example) or engage in excessive stimming only in the privacy of their own homes. We try to limit the stim activities to home. 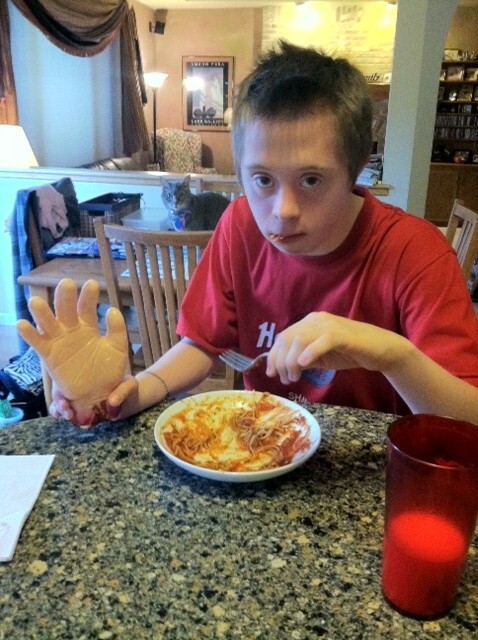 But we respect Nick’s need to manage the excess sensory input that comes into his world. He will always grab up a few things for a car ride but knows that they need to stay in the car once we reach our destination. 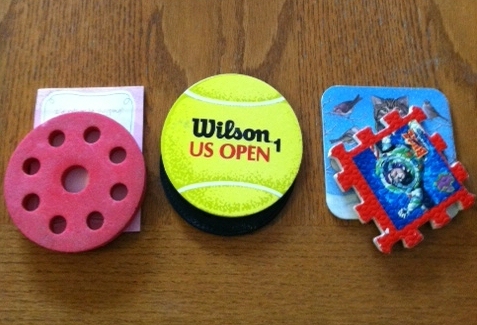 Here are some of Nick’s “tappers” that he raps against his mouth. The foam pieces are much quieter. 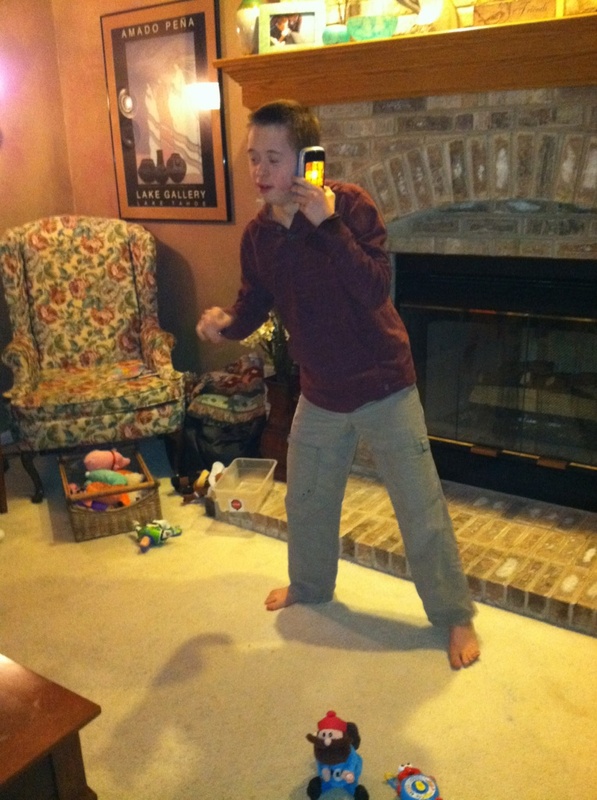 Here Nick enjoys a small music toy that lights up. Notice the basket filled with more stim toys and guess who that is on the floor in front of Nick’s feet? At school he is given down time after his work sessions. Here are some of Nick’s favorite stims at school. The first one is a small baby toy that is totally not age appropriate. But toys such as these are like that stuffed animal or woobie blanket we hold onto for some reason. 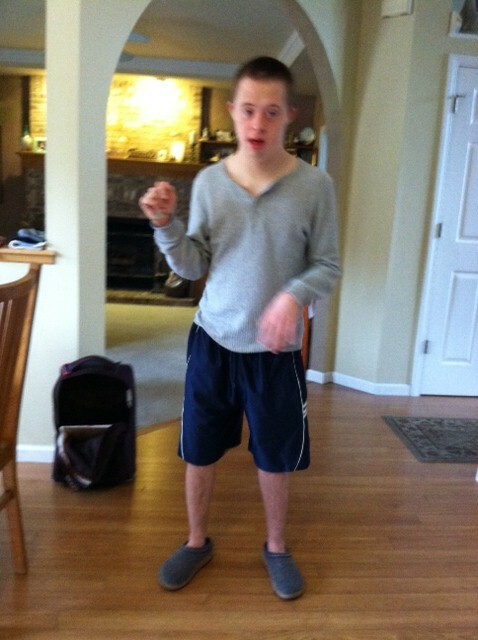 Nick likes the music and dances with it. It also serves for tapping. Here’s another one he enjoys. 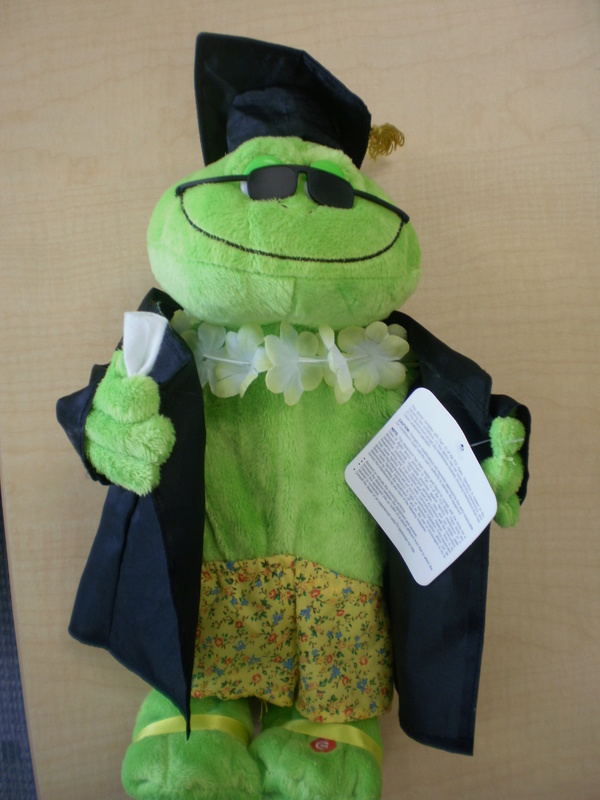 The frog sings “Celebrate” and there’s a party going on right here for Nick……. This is a new acquisition. 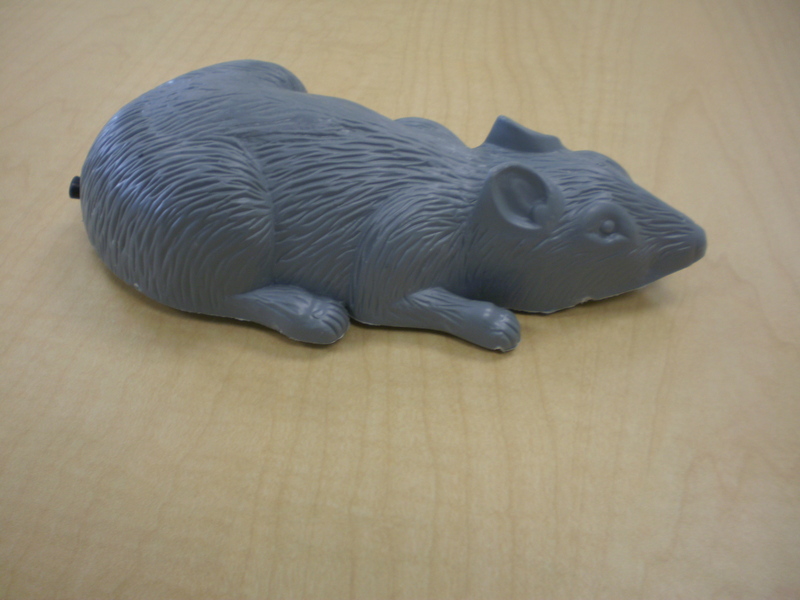 The rat wheels across the table and floor when you pull his tail/string. Nick loves this and enjoys pulling the string and listening to his ear……. 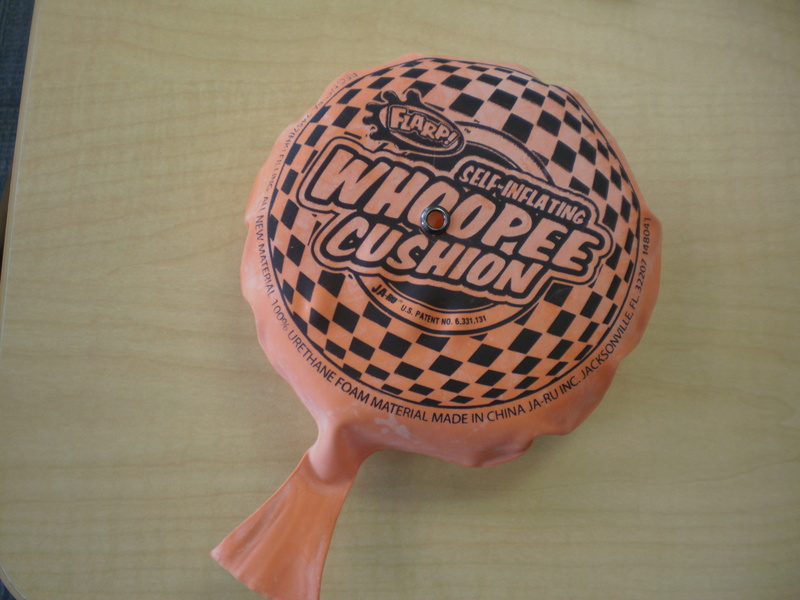 Who doesn’t love a good Whoopee cushion? 🙂 I buy them anytime I see them at Walgreens and now they make them self-inflating! The need to stim is part of our nature. A classic example is my brother. Tom’s legs would rock back and forth while his hand was on the helm during a sailboat race. The tighter the race, the faster those legs banged together. My Mom never forgot the Carefree bubblegum otherwise he would chew the inside of his cheeks raw. Those were his coping mechanisms to stay calm under pressure. What is your stim of choice, whether it is to keep you calm or to rev you up? ******News flash for those of you keeping score at home. 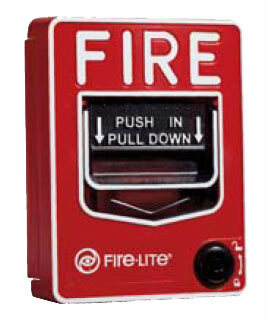 The fire alarm count is now at 26 pulls! Nick decided to put the “trick” in trick or treat on Halloween. Yes, it’s Nick’s world, the rest of us are just trying to keep up!